The Darién Gap between Panama and Colombia has long been known as an impregnable stretch of rainforest, rivers and swamps inhabited by indigenous peoples as well as guerrillas, drug traffickers and paramilitaries. 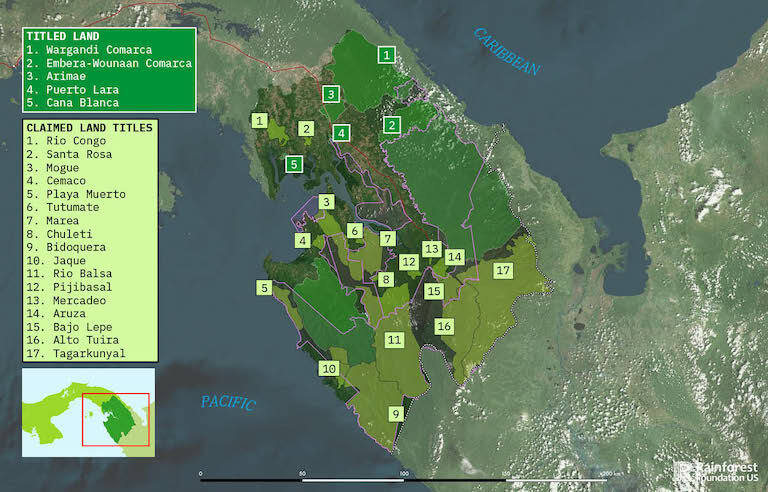 Today the area is undergoing steady deforestation as timber colonists and oil palm entrepreneurs advance across the region, bringing strife and violence to the area’s indigenous residents. 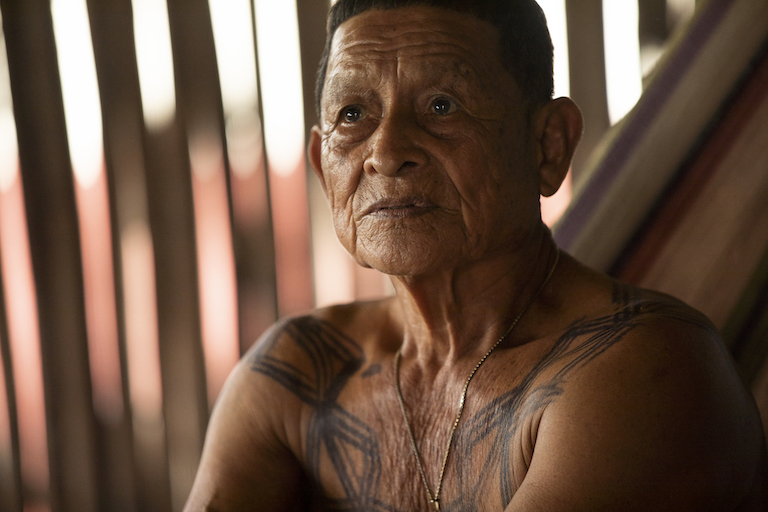 In Panama, some of the Darién’s indigenous communities are working to reverse this situation. Mappers, a drone pilot, a lawyer, bird-watchers, a journalist and reforesters are carrying out ambitious projects to stop the degradation of the Darién Gap. DARIÉN GAP, Panama — There is a land at the center of the Americas that is said to remain in the wild. It is the only place on the entire three-continent landmass where the 30,000-kilometer (19,000 mile) Pan-American Highway is interrupted, a distinction that gives the place its name: the Darién Gap. The name connotes an impregnable 100-kilometer (62-mile) stretch of rainforest, rivers and swamps spanning the Panama-Colombia border and inhabited by ancestral peoples. Like a 21st-century Old West or a tropical Siberia, the myth of the wild Darién has grown since ancient times. The Spaniards could never fully conquer it. The Scots tried to establish a trading colony there in the late 17thcentury, but it ended in misery and death. The outbreak of violence in Colombia in the later 20thcentury brought guerrillas, drug traffickers and paramilitaries, endowing the wild myth with new barbarities. In recent years it has become a route for smugglers and migrants of many nationalities heading north toward the U.S.
Map shows land that indigenous communities have either gained (medium green) or claimed (light green) legal title to. The Emberá-Wounaan Comarca, a self-governing indigenous district with territorial land rights under Panamanian law, was created in 1983, and the Wargandí Comarca in 2000. 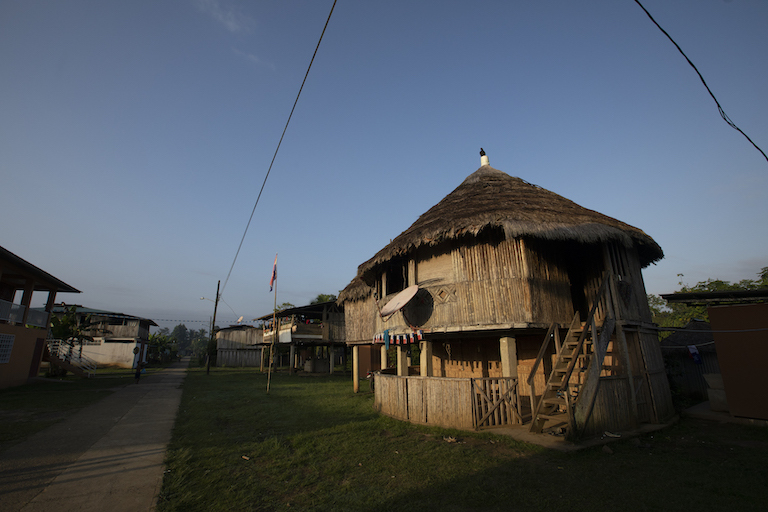 But many indigenous communities were left outside the comarcas without any rights over the territory they inhabit, even within the boundaries of Darién National Park. Some of them were able to obtain collective land for community use. Most were not. 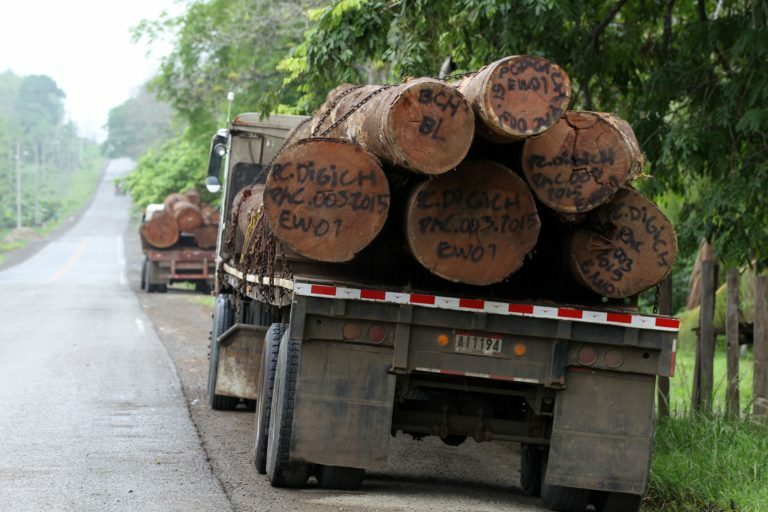 More than 650,000 hectares (1.6 million acres) remain in dispute. The situation is being evaluated by the Washington, D.C.-based Inter-American Commission on Human Rights. Click here to enlarge. Map courtesy of Rainforest Foundation US. 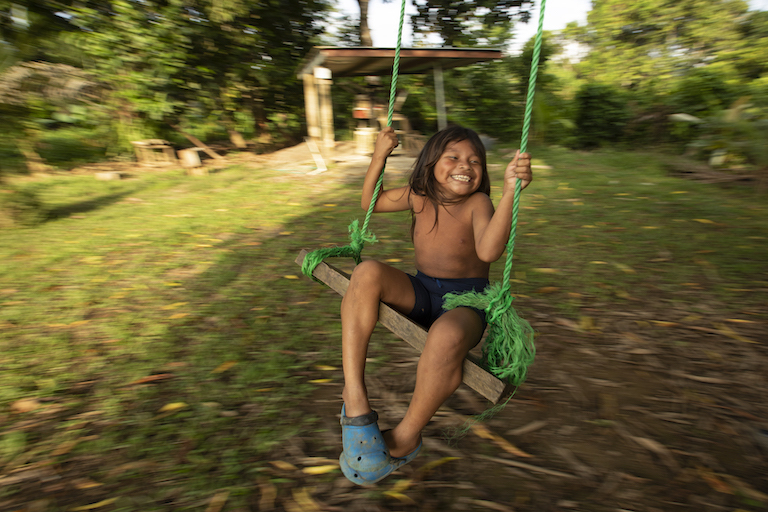 But despite the seeming indifference of the outside world, some among the Darién’s original inhabitants — perhaps 35,000 people in Panama belonging to the Kuna, Emberá and Wounaan indigenous ethnicities — are working to reverse this situation. Mappers, a drone pilot, a lawyer, bird-watchers, a journalist and reforesters are carrying out ambitious projects to stop the degradation of the Darién Gap. Animation shows the evolution of deforestation (pink) in Darién Province between 2001 and 2017. Images courtesy of Rainforest Foundation US. Two events transformed the context and deepened the problem. First, in 2000, the Chinese government published a list of precious rosewoods, the most highly sought-after type of timber in its luxury furniture market. The list includes 33 species from Asia, Africa, and South and Central America, and ranks seven of them as high value. One of these is found mostly in the Darién: the cocobolo (Dalbergia retusa).In Panama, it sells for $4,000 per cubic meter. In China, the value quadruples. A small deforested site in Darién. Illegal loggers reach remote areas like this one by river. 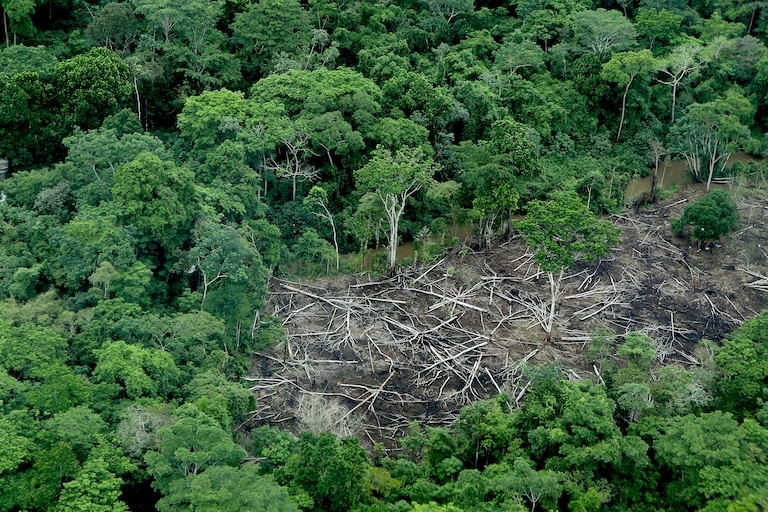 Micro devastations, which reach into Darién National Park, add up to real deforestation. Image by David Mesa for Mongabay. Mappers in the community of Puerto Indio in the Emberá-Wounnan Comarca are working to develop maps of their ancestral territory in order to fight illegal invasions. Image by Alexander Arosemena for Mongabay. 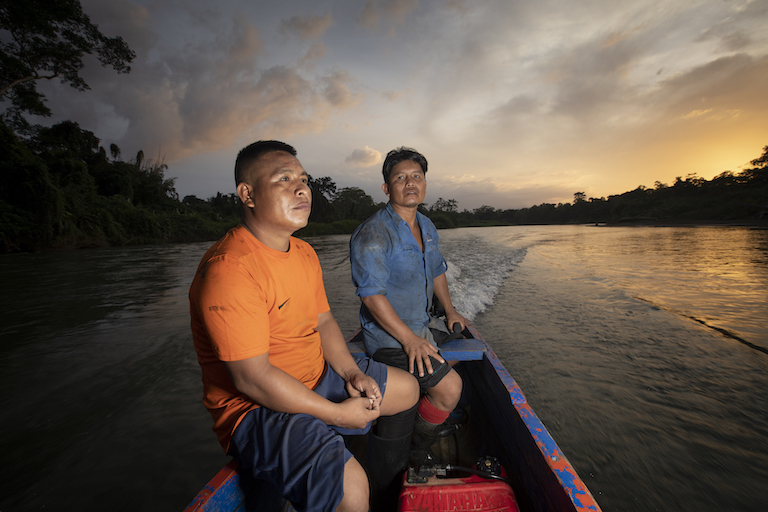 Mappers from Puerto Indio navigate the rivers of the Darién to digitize the boundaries of their community’s territory. Image by Alexander Arosemena for Mongabay. Carpio laughed recalling the faces of visiting officials as they watched the team working with drones, geolocators, computers, design programs and geothermal mapping software. “They could hardly believe it. They have such a big prejudice against Darién,” she said. Carlos Doviaza gathers evidence of land invasions to use in court with drones. Image by Alexander Arosemena for Mongabay. Carlos Doviaza readies his drone for takeoff in the community of Puerto Indio. Every time Doviaza flies his drones, children come to watch. Image by Alexander Arosemena for Mongabay. Sunrise over a Darién rainforest. Image by Alexander Arosemena for Mongabay. 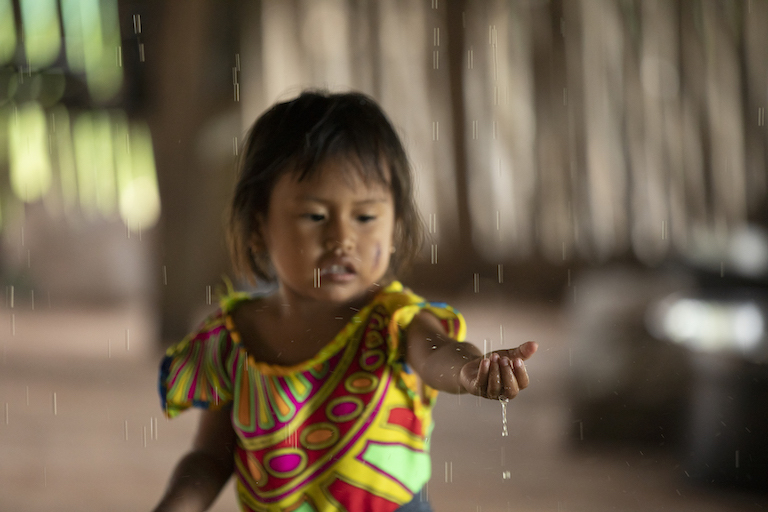 A girl plays with water during one of the many rains that fall in the Darién throughout the year. Image by Alexander Arosemena for Mongabay. Palo Liso, leader of the community of Puerto Lara. Image by Alexander Arosemena for Mongabay. 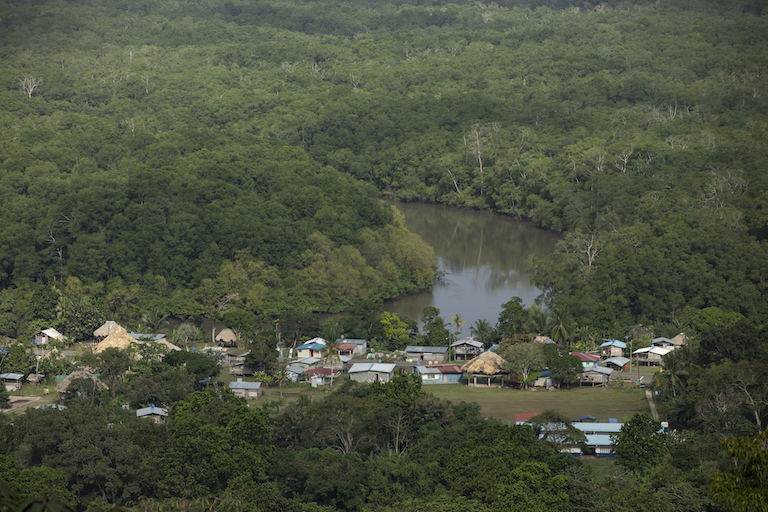 The town of Puerto Lara in the Darién Gap. Image by Alexander Arosemena for Mongabay. 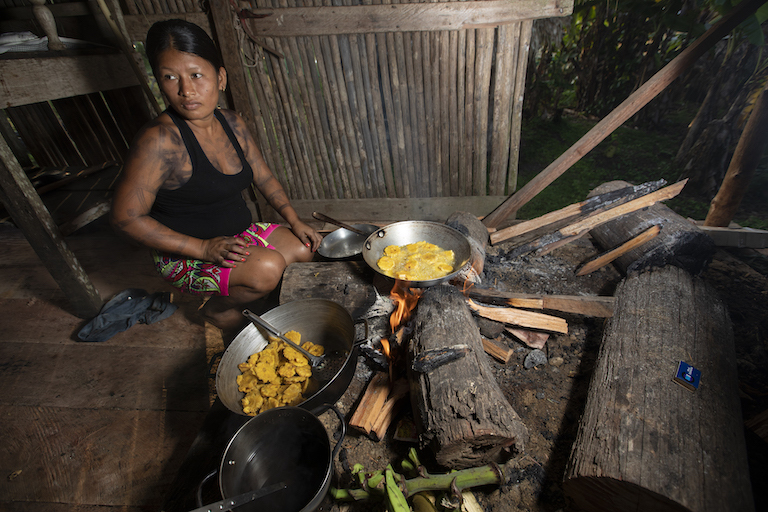 A Wounaan woman prepares patacones, fried plantains, in a traditional fire kitchen in Puerto Lara. Image by Alexander Arosemena for Mongabay. Boat drivers load gas and prepare for a new day in Puerto Indio. 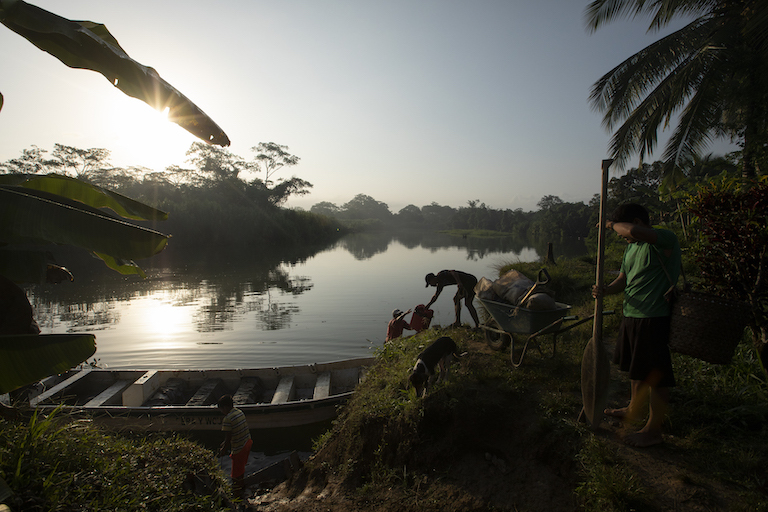 Rivers are the arteries that connect the communities in the Darién Gap. Image by Alexander Arosemena for Mongabay. A traditional Emberá house in Puerto Indio. Image by Alexander Arosemena for Mongabay. 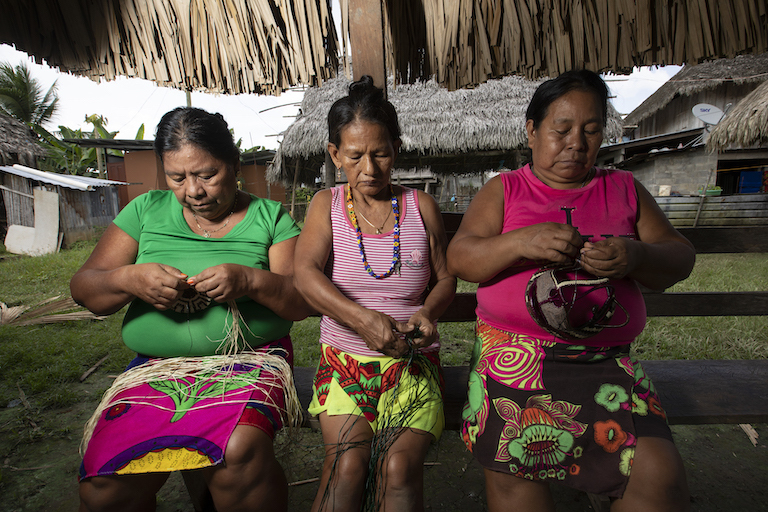 Three Emberá women weave masks and dishes of natural fibers. Image by Alexander Arosemena for Mongabay. A child plays with coffee beans drying in the sun in Puerto Indio. Image by Alexander Arosemena for Mongabay. Flatbed trucks haul logs out of Darién. Image by David Mesa for Mongabay. 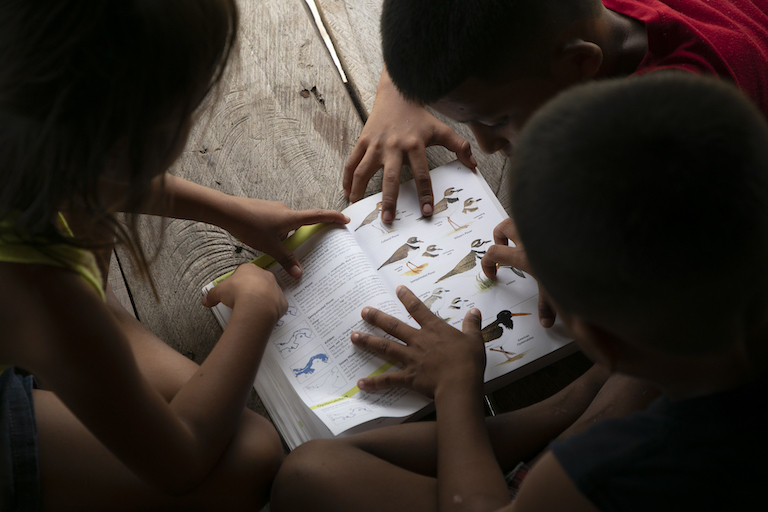 Children are learning the names of the birds in Puerto Lara as the community’s birdwatching project expands. Image by Alexander Arosemena for Mongabay. 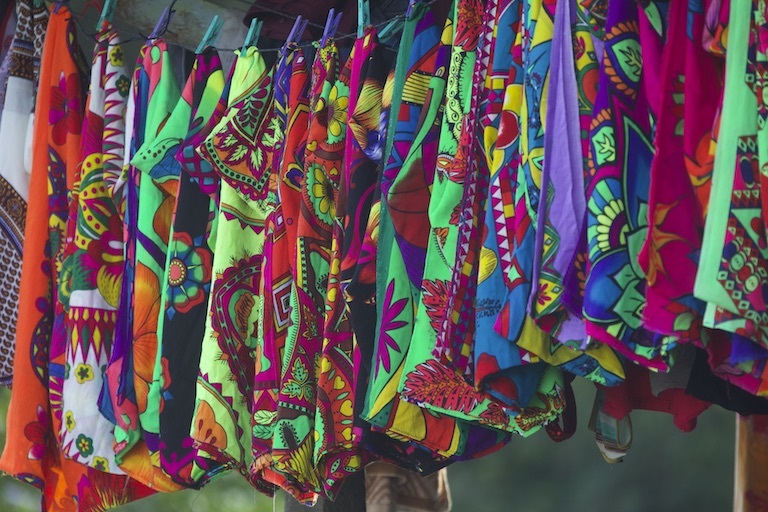 A clothesline of wraparound skirts called parumas in Puerto Lara. Image by Alexander Arosemena for Mongabay. 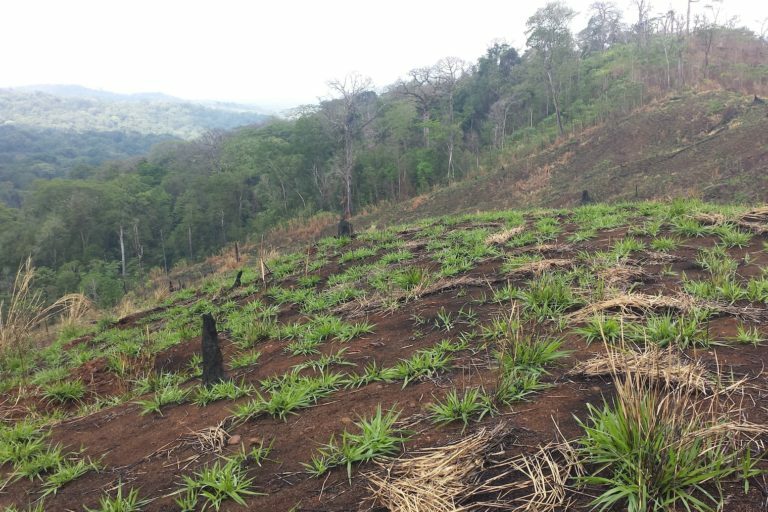 With support from the New York-based Rainforest Foundation US, he travels through the Darién communities, monitoring the health of the forests. As he does, he spreads a message that wealth is not within the forest — it is the forest itself. It grows not by taking valuable goods out of the forest but by spending time there to enrich life. Leonides Quiroz, the Wounaan tribe’s first lawyer, outside the Electoral Tribunal in Panama City. Image by Raphael Salazar for Mongabay. Leonides Quiroz is the first lawyer from the Wounaan ethnic group. He was born in the Darién Gap, in the community of Cémaco Taimatí, where his family arrived escaping from the violence in Colombia. He did not have an easy life. He grew up with his grandmother and his aunt, away from his parents. He left his community when he was 7 to live with a family in Panama City. His tutor there used to tell him that he was destined to be the voice of his people. He managed to go to university and earn a bachelor’s degree in business administration. Devastation is visible just about everywhere in the Darién Gap. Invaders use fire as a tool to appropriate land. In the most recent dry season, more than 166 fires were reported in the region. Image by Alexander Arosemena for Mongabay. In the community of Puerto Lara the Wounaan people organized two bird watching teams to monitor the health of the forest. Here a team participates in the Audubon Christmas Bird Count. Image by Alexander Arosemena for Mongabay. Wounaan dancers perform a traditional dance based on the movements of native birds. Image by Alexander Arosemena for Mongabay. They understand that the diversity and abundance of birds are a measure of a forest’s overall health. The Darién’s intact tropical forests shelter about 600 species of birds. Even its recovering forests, like those in Puerto Lara, can host more than 230 species, as the Oropéndolas Negras have observed. The disappearance of birds — which control insect populations and disperse seeds — prevents the forest’s sustenance and regeneration. 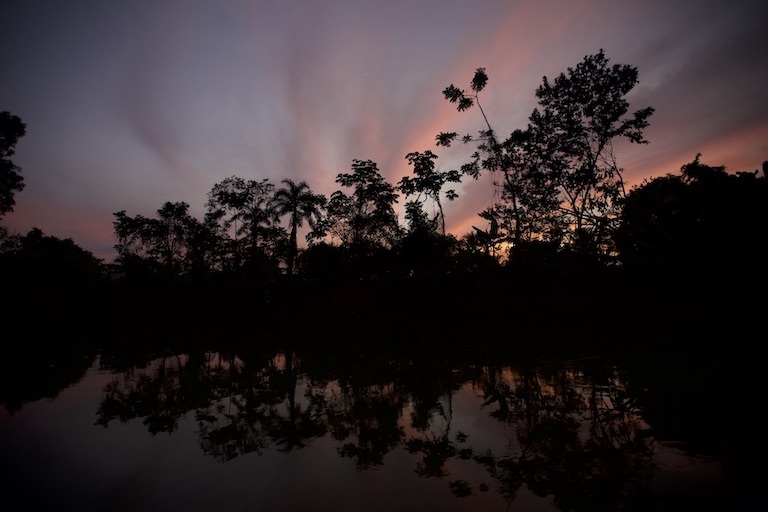 Journalist and activist Ligia Arreaga has received multiple death threats for her work to protect the Darién’s Matusagaratí Lagoon from agricultural business interests. Image by Raphael Salazar for Mongabay. 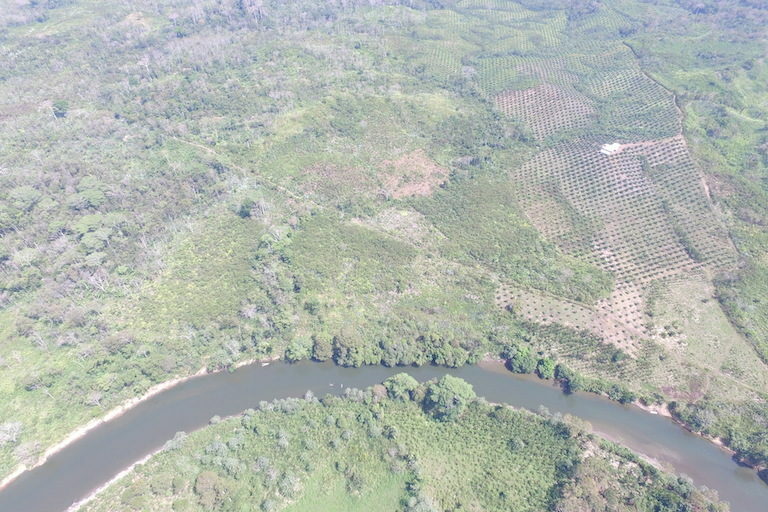 An oil palm plantation along the Tuira River in the Darién. Image by Carlos Doviaza. 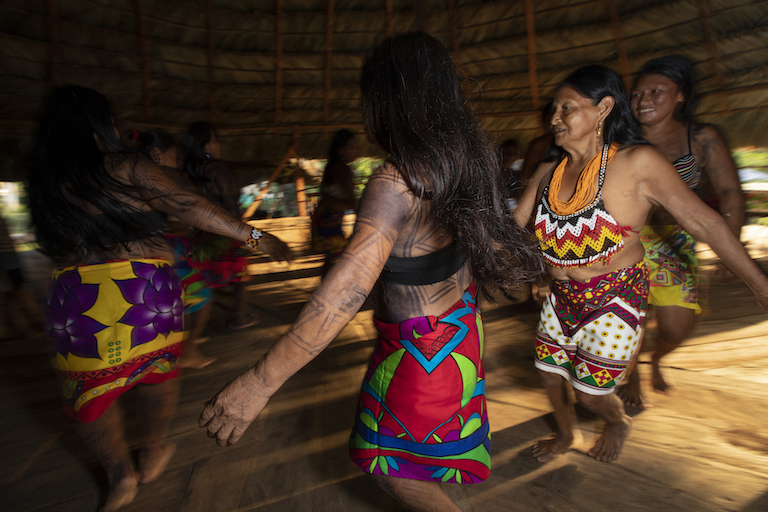 Raquel Cunapio has been restoring the rainforest near her village to bring back native plant species essential for Emberá cultural practices, such as body painting for ritual purpose. Image by Alexander Arosemena for Mongabay. 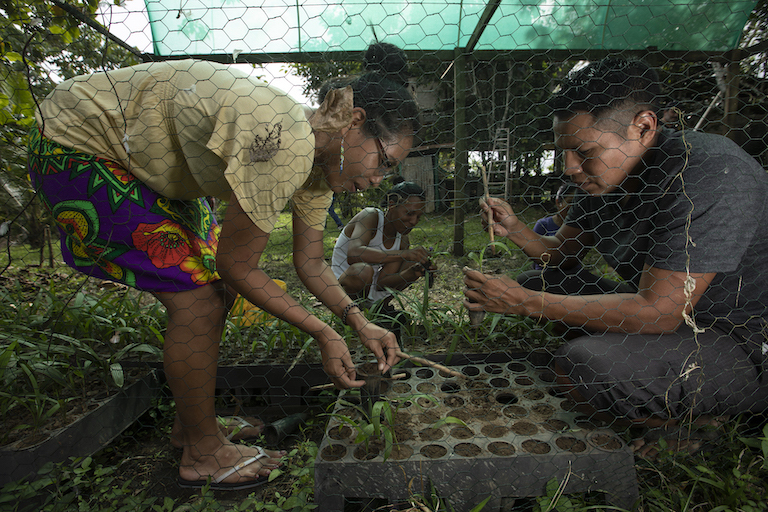 Raquel Cunapio and others plant seedlings to regenerate the forest. Image by Alexander Arosemena for Mongabay. A child in the community of Puerto Indio. Image by Alexander Arosemena for Mongabay. Banner image: A Wounaan bird-watching group from the community of Puerto Lara during a hike in the local forest. Image by Alexander Arosemena for Mongabay. Guido Bilbao is a multimedia journalist and documentary filmmaker. His work focuses on environmental conflicts and indigenous resistance in Latin America. Translation assistance by Cristina Costa.